WAIST HIGH: Ceremony - A New Order Tribute To Benefit Salford Foundation Trust's Tony Wilson Awards. Ceremony - A New Order Tribute To Benefit Salford Foundation Trust's Tony Wilson Awards. From Slicing Up Eyeballs: Florida-based record label 24 Hour Service Station next month will release a two-disc tribute to New Order, proceeds from which will benefit the Salford Foundation Trust's Tony Wilson Awards, established in memory of the late Factory Records co-founder and Manchester musical icon. Due out Feb. 20 - on what would have been Wilson's 60th birthday - the 2 CD version of Ceremony: A New Order Tribute features 33 covers from electronic and indie acts such as Rabbit in the Moon, Detachments and Kites With Lights, as well as a spoken-word dedication from Peter Hook, bassist for New Order and its precursor Joy Division. 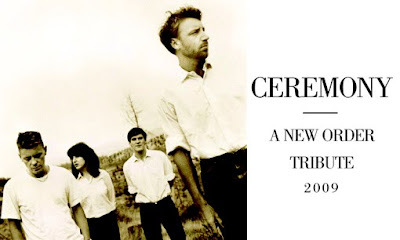 At the same time, 24 Hour Service Station also will issue an 18-track digital edition of Ceremony with an entirely different tracklist, plus a second digital-only album featuring 12 of the participating bands covering "Ceremony," the Joy Division song that became New Order's first single in 1981 following the suicide of singer Ian Curtis. Marshall Dickson, a DJ who started 24 Hour Service Station in 1993, has been compiling the tribute since shortly after Wilson died of cancer in 2007. A portion of the money raised by the project will go the charity established in Wilson's name, which gives grants to children who demonstrate "a special talent or ambition in the arts or creative skills." Tony Wilson was "an English record label owner, radio presenter, TV show host, journalist for Granada Television, and the founder and manager of The Haçienda nightclub. He was one of the five co-founders of Factory Records. Factory Records was a Manchester based British independent record label which featured several prominent musical acts on its roster such as Joy Division & New Order." For more information and to pre-order Ceremony, visit CEREMONY - A New Order Tribute. The Salford Foundation Trust can be found here.